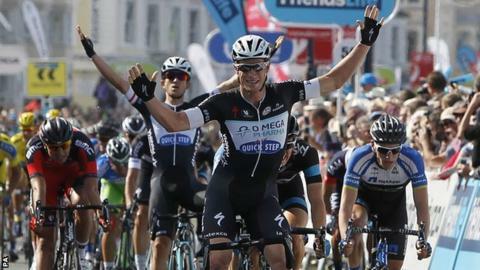 Australia's Mark Renshaw leads the Tour of Britain after winning stage two's sprint finish in Llandudno. The Omega Pharma - Quick-Step rider hit the front in the final 100m of the 200km race to pip Britain's Ben Swift with Ireland's Sam Bennett in third. Marcel Kittel, who won stage one, found the 3km ascent of the Great Orme hill, 8km from the finish, too tough and he lost the leader's yellow jersey. Defending champion Sir Bradley Wiggins finished safely in the peloton. Wiggins came to the front of the main bunch in the final kilometre, in an attempt to lead-out Team Sky team-mate Swift for the stage win but the Rotherham sprinter was unable to hold off Renshaw. It was a well-worked victory from the Omega team after their riders Michal Kwiatkowski and Niki Terpstra attacked separately on the descent of the Orme in an effort to stretch their rivals. Their efforts worked as Renshaw, who is usually trying to deliver Mark Cavendish to the line, sprinted clear on the Llandudno promenade. Cavendish, who was still feeling the effects of a crash on stage one, was not involved in the sprint. What will happen on stage three? While Swift missed out on victory, he could console himself with the points leaders' jersey. "It was really hard out there," he said on the Team Sky website. "The team were brilliant and sat together looking after each other. "The finish was quite a tough one with a bit of a dangerous descent. You needed to be at the front and that's where we were. I just mistimed the sprint and went a little bit too early. We knew it was a bit of a tailwind finish but I could have waited for 50 or 100 metres more. "I've got the points jersey now but our main goal this week is to try and win the yellow jersey with Bradley Wiggins. He's shown that he's in great form."